Theirs is a friendly rivalry, but at events such as the Nortons and the IRNE Awards, teeth are bared and fraternizing with the enemy is frowned upon. Boston’s theater scene includes a number of mid-sized resident professional companies that have grown and prospered through the years. What once were small or fringe, hand-to-mouth operations have become decidedly middle-class, with larger budgets, full-time staff, extensive fund-raising and development and the resources to withstand the economic bumps in the road that have marked the theater scene the past five years. Over the past decade, the Speakeasy Stage Company, the New Repertory Theatre (based in Watertown) and the Lyric Stage Company have upped the ante when it comes to such things as production values and attracting top-tier talent to their stages, be it directors, designers or actors. The rivalry became even more intense after Speakeasy took up residence in the Stanford Calderwood Pavilion at the BCA in 2004 and the New Rep moved into the Mosesian Theatre at the Arsenal Center for the Arts in 2005. With the resulting increase in resources, subscribers, etc.,it was a given the theaters would find themselves competing against each other for awards and critical praise. In the past few years, after seeing Lyric’s “Avenue Q” or Speakeasy‘s “The Light in the Piazza” and “The Drowsy Chaperone,” you realize that the local take was better than that of that higher-priced national tour that preceded it into town. On some occasions, the work being produced by the mid-sized theaters rivals that being done at the American Repertory Theatre and the Huntington Theatre, the heavyweight champions of the local theater scene, and the musicals being done at the North Shore Music Theatre in Beverly. For the sake of this essay, we will include four other theaters in the midsize category in the area — the Stoneham Theatre, about 20 minutes north of Boston; the Gloucester Stage Company, about an hour north of Boston, which runs in the summer while the others are resting; and the Nora Theatre and the Underground Railway Theatre, both in residence at the Central Square Theatre. Critics and theater-goers alike marveled at the magic produced by the New Repertory Theatre’s artistic director, Rick Lombardo, in a Newton church before the company found permanent refuge in 2005 in the Mosesian Theatre at the Arsenal Center for the Arts. Then Lombardo found the way to San Jose and under former artistic director Kate Warner, the company seemed to lose its way. It was hard to discern exactly what the company stood for or what its mission statement was during her time at the helm. It wasn’t that the theater was doing bad work, but why was it doing what it was doing when it was doing it? “Mister Roberts?” There were some head-scratching choices. The theater appeared to be getting back on track in the 2011-12 season under new artistic director Jim Petosa. Last April‘s “Long Day’s Journey into Night” was a major theatrical event, Stephen Sachs‘ “Bakersfield Mist” copped a Norton for best new script and “Three Viewings” was another compelling evening of theater during the 2011-12 season. The Lyric Stage Company was founded in 1974 in a theater on Charles Street, and in 1990 moved into its present home in the YWCA Building on Clarendon Street., but it was the dynamic leadership of artistic director Spiro Veloudos, previously of the Publick Theatre, that brought it to another level. Veloudos, who came on board in 1997, staged large-scale musicals and dramas in the intimate second-floor theater on Clarendon Street, his imagination rarely limited by the size of the house. 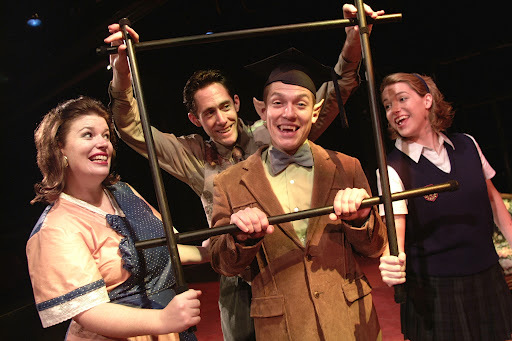 Miguel Cervantes (center) with (clockwise from left); Kerry A. Dowling, Michael Mendiola, and Sara Chase in the 2002 SpeakEasy Stage production of ” Bat Boy: The Musical.” The show was a turning point for the company. The difficulties of staging Sondheim’s sprawling “Sunday in the Park with George” (2001)? Bring it on. 2010’s “Nicholas Nickleby,” with 24 characters portraying 150 characters over six hours and 1,600 costume changes? No problem. Veloudos specializes in challenging himself, his staff and even his physical facility. He has yet to overreach. Perhaps he never will. It can be said that one show — the critically-acclaimed and financially successful 2002 production of “Bat Boy: The Musical,” and its encore runs — did as much as anything else to lift the 20-year-old Speakeasy Stage Company from the small/fringe category solidly into the middle class. Then Speakeasy moved from the black box Plaza Theatres at Boston Center for the Arts to the more spacious confines of the Calderwood Pavilion next door, usually the Roberts Studio Theatre but also the more spacious Virginia Wimberly Theatre, where it staged its award-winning production of John Logan’s “Red” this winter. Speakeasy’s longtime marketing director, Jim Torres, is also there in the lobby to provide a warm welcome at the Calderwood Pavilion and perform his own version of Veloudos’ welcoming address; he’s also getting feedback and audience reaction. It is outside the realm — it’s about an hour from downtown Boston to Main Street in East Gloucester — but the Gloucester Stage Company, founded by the prolific playwright Israel Horovitz in 1979, is finishing up one of its best seasons in years, and deserves to be mentioned in the same breath with its Boston-area brethren.. Artistic director Eric Engel has lured some of the best talent in the area up to Cape Ann, mixing recurring guest artists such as Lindsay Crouse with the cream of the local crop. The opening of the Central Square Theatre in Cambridge in August 2008 gave its two resident theater companies — the Nora Theatre and the Underground Railway Theatre — a permanent home and the opportunity to grown in both size and stature. The versatile space lends itself to multiple configurations. Wesley Savick and Michael Wartofsky’s musical “Car Talk” was a breakaway hit this summer. Years ago, the companies mentioned here might followed up a strong production with one at a lower level. The rising tide has lifted the boats to a certain level that they don’t often dip below. There’s always room at the top. But the middle is getting pretty crowded.